"Ghosts Of The Trail Of 1942"
Alaska Highway construction had actually been approved by a Bill in Congress in 1929, but was never pursued until WWII. Seventy-five years have past since the first United States Army Engineers arrived in Dawson Creek, British Columbia, Canada to begin construction of the Alaska Military Highway. Today the highway is a paved modern highway and driving it is easy. Gone are the curves, steep mounain pases and miles of gravel road. Since 1985 I have driven on the highway 21 times and each drive I find more "Ghosts Of The Trail Of 1942". It is my intent to list the ghosts I have found along the highway for everyone to enjoy during their trip. Many people believe that the dream of a route through Canada to Alaska only traces back to the Klondike Gold Rush of 1898. I believe the dream goes much further back to the time of the crossing of the land bridge by Asians more than 1000 years ago. The decendents of the Asians are linked to the North American Indigious peoples of Canada and the United States. The trails they blazed since their arrival are becoming the highways of today. Ancestors of the Alaska Natives are known to have migrated into the area thousands of years ago, in at least two different waves. Some are descendants of a third wave of migration in which people settled across the northern part of North America. They never migrated to southern areas. For this reason, genetic studies show they are not closely related to Native Americans in South America. However, they are related to the Native Americans of Canada and the United States. Russian America (Russian: Русская Америка, Russkaya Amerika) was the name of the Russian colonial possessions in North America from 1733 to 1867. Settlements spanned parts of what are now the US states of California, Alaska, and two ports in Hawaii. Formal incorporation of the possessions by Russia did not take place until the Ukase of 1799 which established a monopoly for the Russian–American Company and also granted the Russian Orthodox Church certain rights in the new possessions. Many of its possessions were abandoned in the 19th century. In 1867 Russia sold its last remaining possessions to the United States for $7.2 million ($1.76 billion in 2015 dollars). The Alaska Purchase was the United States' acquisition of Alaska from the Russian Empire on March 30, 1867, by a treaty ratified by the United States Senate, and signed by president Andrew Johnson. 1821-1903 The Alaska boundary dispute was a territorial dispute between the United States and the United Kingdom, which then controlled Canada's foreign relations. It was resolved by arbitration in 1903. The dispute had been going on between the Russian and British Empires since 1821, and was inherited by the United States as a consequence of the Alaska Purchase in 1867. The final resolution favored the American position, and Canada did not get an all-Canada outlet from the Yukon gold fields to the sea. The disappointment and anger in Canada was directed less at the United States, and more at the British government for betraying Canadian interests in favour of healthier Anglo-American relations. Ref. The Spanish–American War (Spanish: Guerra hispano-estadounidense or Guerra hispano-americana; Filipino: Digmaang Espanyol-Amerikano) was a conflict fought between Spain and the United States in 1898. Hostilities began in the aftermath of the internal explosion of the USS Maine in Havana harbor in Cuba leading to United States intervention in the Cuban War of Independence. American acquisition of Spain's Pacific possessions led to its involvement in the Philippine Revolution and ultimately in the Philippine–American War. Ref. The Klondike Gold Rush: On August 16, 1896, an American prospector named George Carmack, his Tagish wife Kate Carmack (Shaaw Tláa), her brother Skookum Jim (Keish), and their nephew Dawson Charlie (K̲áa Goox̱) were travelling south of the Klondike River. Following a suggestion from Robert Henderson, another prospector, they began looking for gold on Bonanza Creek, then called Rabbit Creek, one of the Klondike's tributaries. It is not clear who discovered the gold: George Carmack or Skookum Jim, but the group agreed to let George Carmack appear as the official discoverer because they feared that mining authorities would be reluctant to recognize a claim made by a Native American. Ref. The Klondike Gold Rush was a migration by an estimated 100,000 prospectors to the Klondike region of the Yukon in north-western Canada between 1896 and 1899. Gold was discovered there by local miners on August 16, 1896 and, when news reached Seattle and San Francisco the following year, it triggered a stampede of would-be prospectors. Some became wealthy, but the majority went in vain. It has been immortalized in photographs, books, films, and artifacts. World War I (WWI or WW1), also known as the First World War, the Great War, or the War to End All Wars, was a global war originating in Europe that lasted from 28 July 1914 to 11 November 1918. More than 70 million military personnel, including 60 million Europeans, were mobilised in one of the largest wars in history. Over nine million combatants and seven million civilians died as a result of the wr (including the victims of a number of genocides, a casualty rate exacerbated by the belligerents' technological and industrial sophistication, and the tactical stalemate caused by gruelling trench warfare. It was one of the deadliest conflicts in history, and paved the way for major political changes, including revolutions in many of the nations involved. Ref. Proposals for a highway to Alaska originated in the 1920s. Thomas MacDonald, director of the U.S. Bureau of Public Roads, dreamed of an international highway spanning the United States and Canada. In order to promote the highway, Slim Williams originally traveled the proposed route by dogsled. Since much of the route would pass through Canada, support from the Canadian government was crucial. However, the Canadian government perceived no value in putting up the required funds to build the road, since the only part of Canada that would benefit was not more than a few thousand people in Yukon. However, some route consideration was given. The preferred route would pass through the Rocky Mountain Trench from Prince George, British Columbia to Dawson City before turning west to Fairbanks, Alaska. 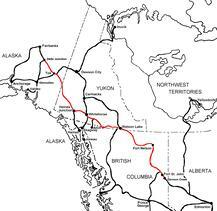 In 1929 the British Columbia government proposed a highway to Alaska to encourage economic development and tourism. American President Herbert Hoover appointed a board with American and three Canadian members to evaluate the idea. Its 1931 report supported the idea for economic reasons, but both American and Canadian members recognized that a highway would benefit the American military in Alaska; the Great Depression and the Canadian government's lack of support caused the project to not proceed. When the United States approached Canada again in February 1936, the Canadian government refused to commit to spending money on a road connecting the United States. The Canadians also worried about the military implications, fearing that in a war between Japan and North America, the United States would use the road to prevent Canadian neutrality. During a June 1936 visit to Canada, President Franklin D. Roosevelt told Prime Minister W. L. M. King that a highway to Alaska through Canada could be important in quickly reinforcing the American territory during a foreign crisis. Roosevelt became the first American to publicly discuss the military benefits of a highway in an August speech in Chautauqua, New York. He again mentioned the idea during King's visit to Washington in March 1937, suggesting that a $30 million highway would be helpful as part of a larger defense against Japan that included, the Americans hoped, a larger Canadian military presence on the Pacific coast. Roosevelt remained a supporter of the highway, telling Cordell Hull in August 1937 that he wanted a road built as soon as possible. Ref. The Permanent Joint Board on Defense — Canada and the United States — decided in the autumn of 1940 that a string of airports should be constructed at Canadian expense between the city of Edmonton in central Alberta and the Alaska-Yukon border. Late in 1941 the Canadian government reported that rough landing fields had been completed. Ref. The route was originally a trail used by Chilkat Tlingit traders, which eventually became the Dalton Trail. It was used by some prospectors during the Klondike Gold Rush of 1898-1899; other mining kept the lower Dalton Trail active through the years following its establishment. The British Columbia provincial government converted its portion of the trail to a wagon road in 1909 when copper mining began at Copper Butte and Mt. Glave. In 1911, 30 tons of ore were shipped from the mines. The highway was built by the U.S. Army in 1943 as an alternate route from the Pacific Ocean to the Alaska Highway, in case the White Pass and Yukon Route railway from Skagway should be blocked. The total cost of the construction was US$13 million. Haines-to-Fairbanks Pipeline: 1945 - 1971 Ref. It is notable that the US Army, who ended up building the highway, were the ones to argue that the funds needed for a highway project would be better spent elsewhere. The same highway could, if the Japanese invaded Alaska, be used by the Japanese to attack the US Midwest. President Roosevelt was determined to forge ahead, deciding at the same time to develop the oil fields around Norman Wells, Northwest Territories and to build a pipeline hundreds of miles across the sub-Arctic mountains to Whitehorse. Ref. US Army General Hoge was put in charge of the highway's construction. He needed to decide precisely where the highway would go, which was daunting when reviewing the topographical maps. Hoge depended on Les Cook, an accomplished northern bush pilot, who helped him find a route through the largely unmapped mountain ranges of northeastern British Columbia. Cook sadly died in a plane crash in Whitehorse, but not before he helped decide the Alaskan Highway's location. Ref. Workers descended on to the Canadian Northwest on a scale not experienced since the Klondike Gold Rush. From April 1942 to May 1943, the United States sent over 11,000 troops to work on highway construction, followed by an even larger and more diverse group of civilian contractors. 11,000 pieces of heavy construction equipment came with the Us Army, populating the region with metal machines and man-power. Ref. The work was hard and the conditions often brutal. The cold and the intense hours and pace of the work were inhuman. Lack of sleep took its toll with wrecked vehicles strewn by the roadside. Warmer weather brought more misery. Rivers flooded, trucks were trapped in mud, and Alaskan mosquitoes were so thick men claimed they swallowed them in mouthfuls. Ref. More manpower was needed and with a war going on it wasn't easy to recruit more people. The War Department sent several Black units to work on the northern half of the highway. Black troops, following discriminatory rules which governed their participation in the war in general, operated under markedly different conditions than their White counterparts. They were kept away from towns and villages in the region. Many of the troops said that they got fewer supplies than White units did. Ref. William E. Griggs was the official photographer of the US Army’s 97th Engineers Battalion. The 97th was an all-Black battalion responsible for the construction of the Alaska Highway north from Slana, Alaska to the Tanana River and south to the Alaska-Canada border. They accomplished this with such efficiency and skill that they actually moved well into the Yukon. Griggs took over 1,000 images of the construction of the Highway, as well as his battalion’s training at Elgin Field, Florida and their journey northwest by rail to Seattle and then north by ship to Valdez, Alaska. Ref. "Of the 10,670 troops assigned to Alaska, 3,695 of them were African-Americans; they were seldom, however, mentioned in US Government press releases." Ref. Whitehorse, a small, somewhat seasonal transportation hub of a few hundred citizens, exploded to over 10,000 people. Most of these newcomers lived in tent camps. Whitehorse became a boomtown with saloons, shops and a general buzz of activity. Ref. The Alaska Highway was officially opened in a ceremony at Soldier’s Summit on November 20, 1942. Representatives of the US military and the Canadian Government attended. The Alaska Highway was a rugged, unfinished and difficult road. Paul Seddicum, US Consul in Edmonton, said of the highway in 1947, “I may be prejudiced but I feel strongly that there is no attraction connected with the Highway great enough to make the discomfort and possible danger worth the effort.” Ref. The fact that no road construction project of this magnitude had ever been undertaken in a sub-Arctic setting did not go unnoticed. Charles Camsell, a writer aptly stated, “Herein the United States and Canada have been carrying out a great experiment. Let us all hope it will meet with a success which will recommend it to the policy-makers of the world.” Ref. 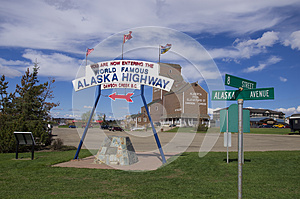 The Alaska Highway today has been through many changes and upgrades and has seen hundreds of thousands of travelers. "Surviving" the journey is still bragged about with an air of mystery and great accomplishment, however the road to Alaska has never been in better condition. This famous, breathtaking and coveted journey is part of National Geographic's Drives of a Lifetime and is on everyone's must-do list for 2017. Come celebrate the Alaska Highway's 75th birthday! Ref. The Alaska Highway (also known as the Alaskan Highway, Alaska-Canadian Highway, or ALCAN Highway) was constructed during World War II for the purpose of connecting the contiguous United States to Alaska across Canada. It begins at the junction with several Canadian highways in Dawson Creek, British Columbia, and runs to Delta Junction, Alaska, via Whitehorse, Yukon. Completed in 1942 at a length of approximately 1,700 miles (2,700 km), as of 2012 it is 1,387 mi (2,232 km) long. The difference in distance is due to constant reconstruction of the highway, which has rerouted and straightened out numerous sections. The highway was opened to the public in 1948. Legendary over many decades for being a rough, challenging drive, the highway is now paved over its entire length. Ref. An informal system of historic mileposts developed over the years to denote major stopping points; Delta Junction, at the end of the highway, makes reference to its location at "Historic Milepost 1422." It is at this point that the Alaska Highway meets the Richardson Highway, which continues 96 mi (155 km) to the city of Fairbanks. This is often regarded, though unofficially, as the northern portion of the Alaska Highway, with Fairbanks at Historic Milepost 1520. Mileposts on this stretch of highway are measured from Valdez, rather than the Alaska Highway. The Alaska Highway is popularly (but unofficially) considered part of the Pan-American Highway, which extends south (despite its discontinuity in Panama) to Argentina. Ref. The Alaska Highway is one of the worlds most historic and scenic driving routes. Starting in Dawson Creek, British Columbia at Historic Milepost 0, through the Yukon Territory in Canada and on to Delta Junction, Alaska, U.S.A. at Historic Milepost 1422. It is a world famous highway recognized as the "16th Wonder of the Engineered World". Ref.